From a quaint tea house in an idyllic setting in Tokyo, to the wanting tea room of the bleak Lobby Lounge in Kawagoe. Today’s post is ironically in stark contrast to yesterday’s. You would think that Tokyo would have the austere building and impersonal afternoon tea and that Kawagoes’ would be full of charm and character. But it was the other way around. Yesterday (Thursday February 7th) was the first time I had stepped foot in the Kawagoe Prince Hotel in seven years. I don’t remember it being so sharp and sombre. I might have been more aware of this yesterday as I was dining there this time, unlike my last visit when I was just looking for a bed for the night. And when I mean I was dining there: I mean right there in the lobby of the hotel. The Kawagoe Prince Hotel is part of the Prince Hotels Chain. Two of the most illustrious of those are probably the prestigious Karuizawa Prince Hotel and the flagship Prince Park Tower Tokyo. I had been to both and so I was expecting something very different from the Prince Hotel in Kawagoe. Kawagoe Prince Hotel is an official partner to Metsa Village, even though they are about 20 kilometres from each other. The Kawagoe Prince Hotel seems to be a 3 star hotel, but the lobby is more 2 star than 3. I have actually seen nicer lobbies in 1 star hotels. However, if you don’t judge it on first appearances and give it a chance there are a lot of merits to this centrally located hotel. As the name suggests the Lobby Lounge of Kawagoe Prince Hotel is in the foyer of the hotel. However, usually “lobby lounges” are just close to the main lobby and not bang smack in them. Or they are least segregated by some classy partitions and a change of flooring. No, Kawagoe Prince Hotel decided to take a literal interpretation of the English and section of a considerable chunk of the main lobby for their tea room essentially. There are little chain ropes to mark off the eatery, but other than that they didn’t do much to add any atmosphere or character to the lounge. The flooring is like the rest of the ground floor entrance: tiles. I don’t think any other hotel I have ever stayed in or visited has had tiles in their lobby lounge – it’s always carpet or wood right!? It doesn’t do much for the ambiance, which is pretty non existent. The place is sorely lacking any kind of atmosphere and they have done little to decimate the bleak surroundings. Except for some wooden figures from Shinrin Park, flowers, a piano and giant bottles of champagne. It feels like you are sitting in a corridor – because essentially you are! I was a little disappointed when I saw the set up. However, the seats are a lot more comfortable than they look; wide plush soft armchair type seats you could fall asleep in. And with only a handful of customers there and non-intrusion from the staff, you can relax and talk boisterously, which is what we were there to do! Thankfully, I was in the excellent company of one of my besties here in Japan, so we could be sitting in a cow shed and still enjoy food together. And that brings me to, the reason we were there (well other than to chat, laugh and catch up); to taste their Afternoon Tea. 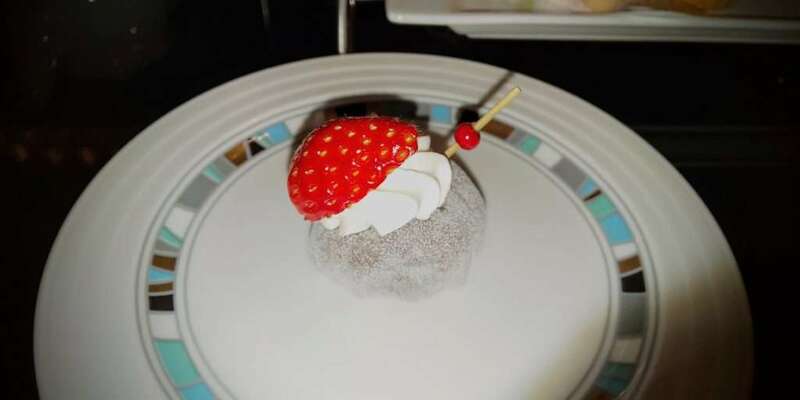 Kawagoe Prince Hotel currently has a special menu for Valentines and White Day “Strawberry selection”. They don’t use the term Afternoon Tea, but essentially that is what it is. I would guess they didn’t use the term Afternoon Tea, because the Afternoon Tea Rooms of Maruhiro have that term monopolised. If you search “Afternoon Tea Kawagoe” in English or Japanese the first three search engine result pages are filled with results for the Maruhiro branch of the chain tea store Afternoon Tea. 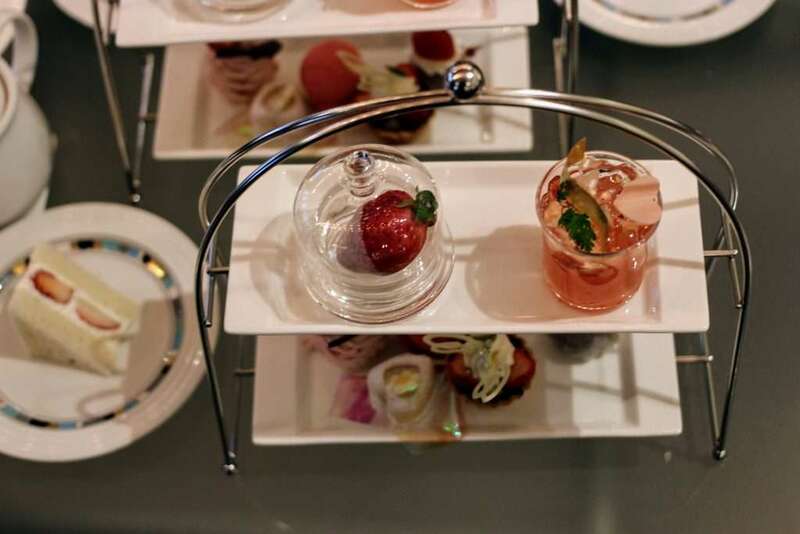 This limited period Afternoon Tea at Prince hotels, is as the name suggests, made up of strawberries. The presentation and appearance is exquisite. Even the sandwich of the assortment is filled with strawberries and cream. 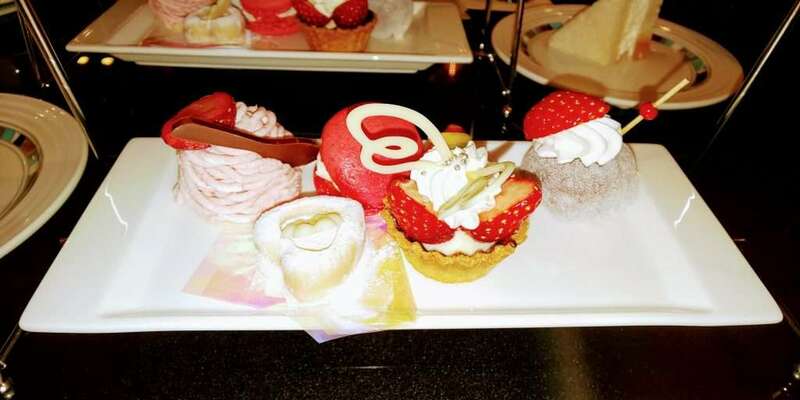 Each bite of dessert is simply delicious. If you are thinking it looks a bit small, in truth I thought the same before I delved in. But it is just the right amount to fill your stomach and not make you sugar sick. My favourite was surprisingly the Japanese dessert “daifuku” with red bean filling topped with cream and strawberry. 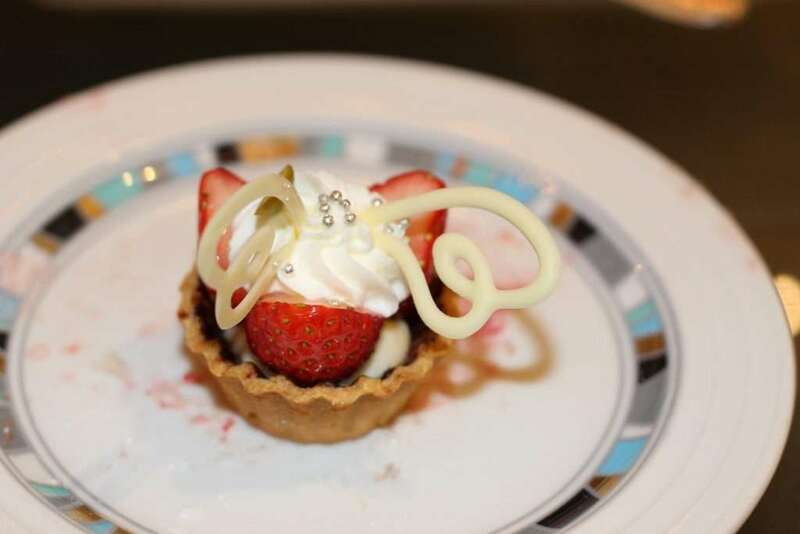 The raw white chocolate with strawberry liquer was truly delectable and tied for first place for me. Actually wait, the strawberry dipped in strawberry chocolate was divine. Make that three number ones! My second favourite was the strawberry mont blanc complete with chocolate spoon. And although I wouldn’t rate it high and I can’t usually stomach macarons, the one in the Strawberry Selection was just the right amount of strawberry flavoured meringue. The jelly was really good too. Meanwhile, the tart with the white chocolate butterfly looked the part and so I saved it for last, but it was actually the least appetising of them all. 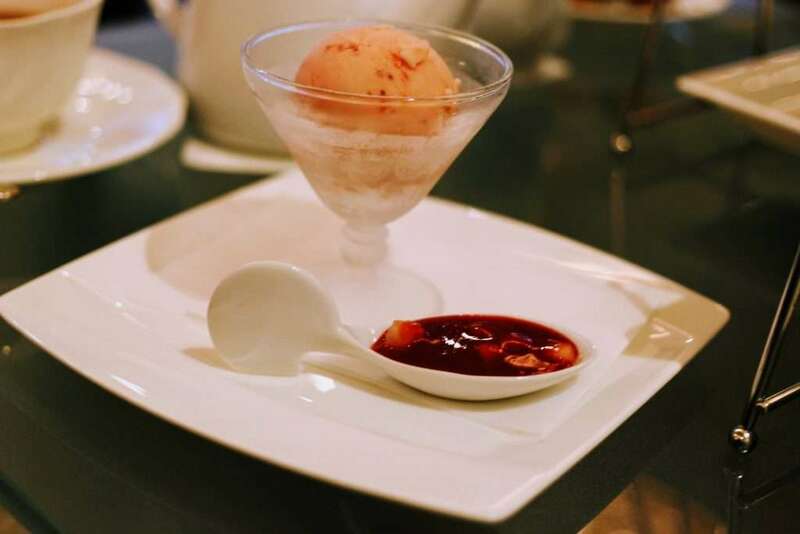 After you finish everything on the tiered plates, they bring the ice-cream with strawberry sauce. With the Afternoon tea plate you get to drink as much as you like of a selection of teas, hot or cold coffee or a soft drink. The lobby lounge is table service, so you need to order any beverage from your server. You don’t have to just get refills of the initial drink you ordered: you can switch to anything on the drinks menu as often as you like. Another little fault I would like to point out: they don’t have milk jugs, so the milk is in those little UHT milk drops. It does take away from the authenticity of an afternoon tea. Other than that though, the strawberry selection was worth sitting in a corridor for! Time: from 12 noon until 5.30 pm. The lounge is open from 11 am, but they only serve the strawberry selection from midday. 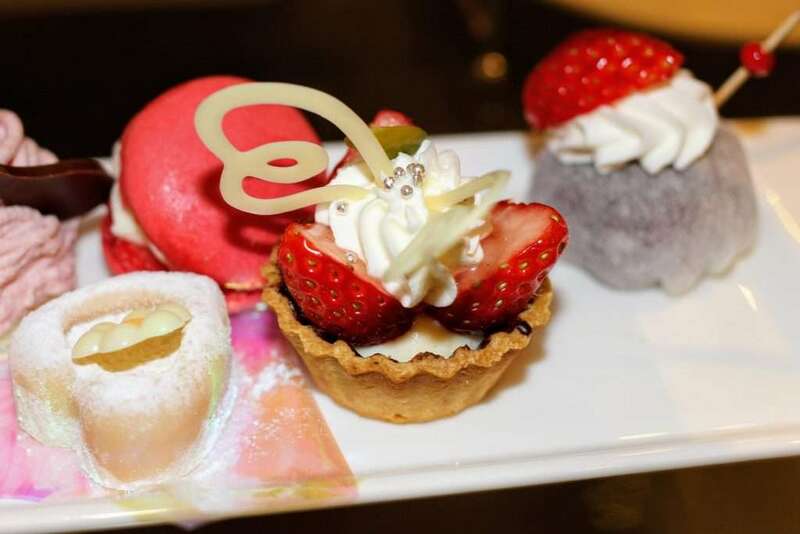 Cost: 2,400 yen per person, 100 yen discount if you have a Seibu Prince Club Card, plus 10% service charge for Strawberry Selection Afternoon Tea with all you can drink (table service) of a selection of beverages. Parking validated for five hours. Parking available; it costs 400 yen per hour, but if you are dining or staying in the hotel they will validate your parking. For Afternoon Tea my parking was validated for five hours. Haha! We were in green, to set off the pink nicely! !